Sitler’s is a Platinum Rebates Dealer! Sitler’s prides itself on helping our clients not only get the best-LED lights on the market with quick and efficient installation, but also the best rebates available from their utility companies. Thanks to our amazing customers trusting us to help with rebate paperwork, we have been named a Platinum Rebates Dealer by Alliant Energy! 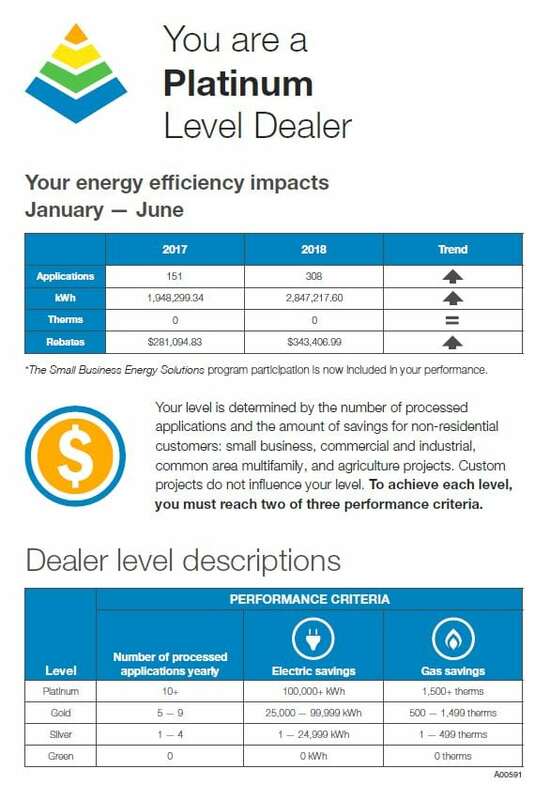 Based on our work with customers in Alliant territory from January to June of this year, we have doubled our rebate applications from 151 in 2017 to 308 in 2018, as well as doubling number of kWh saved, and providing our customers with a total of $343,406.99 in rebates in six months alone! These numbers reflect the rebates we have granted to our non-residential customers: small businesses, commercial and industrial clients, multifamily facilities, and agricultural projects. To be named a platinum dealer, we had to have 10 or more applications processed yearly, saving a minimum of 100,000 kWh, and offering gas savings of 1,500 or more therms. We want to say a warm thank you to all of our past and present clients for trusting us with your business’ lighting, and allowing us to help you make the transition to better, brighter, more efficient and cost-effective LED lighting! We look forward to continuing to bring LEDs, and all of their many benefits, to more clients across the Midwest.